The Margay (Leopardus wiedii) is a small wildcat that can be found in the forests of Central and South America. Margays are among the most skilled climbers of all cats - like the Clouded Leopard, it has the ability to rotate its hind ankles 180 degrees, which allows it to climb down trees head-first. Margays are able to hang from tree branches from both its fore and hind paws - they've even been observed hanging from one paw. Margays are nocturnal and live much of their lives in the trees. It hunts by chasing prey animals through the tree branches, which include monkeys, birds, lizards, squirrels and tree frogs. It will occasionally venture to the ground to hunt rats and guinea pigs. Margays have recently been observed using mimicry to hunt as well, imitating the distress cry of pied tamarin infants in order to lure adults into investigating. Some scientists consider this type of behavior analogous to tool use by primates, and it is the first Neotropical predator to be observed using this technique. 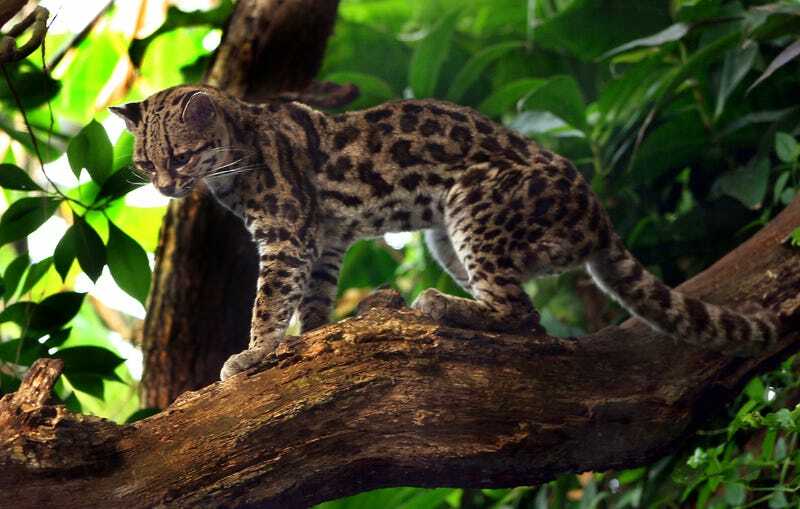 Margays grow to about 31 inches (79 cm) in body length, with a 20-inch (51 cm) tail. They weigh only 8.8 pounds (4 Kg) at most. Female Margays will give birth to a litter of one kitten - only rarely will there be two kittens in a litter - after an 80-day gestation period. Margay kittens have a similar mortality rate to other wild cats, with only half of them surviving to adulthood. With such small litter sizes, the difficulties involved in breeding them in captivity, and the rate of decline in their populations, it makes for quite a task for conservationists to try to increase the overall population. Margays are hunted for their fur. About 14,000 are killed each year for the fur trade. This, coupled with the loss of habitat due to deforestation, means that its overall population has declined to the point where it has been listed as Near Threatened by the IUCN.